Today is Facebook Fridays! for November 9, 2018. What to do when love goes wrong? It's the single most asked question for those turning to conjure and hoodoo. We are here to help you learn the arts of returning a lover, reconciling with a spouse, and restoring a relationship! The Lucky Mojo Curio Company is holding a random drawing to give away 4 spiritual supply prizes to help you practice true love magic! 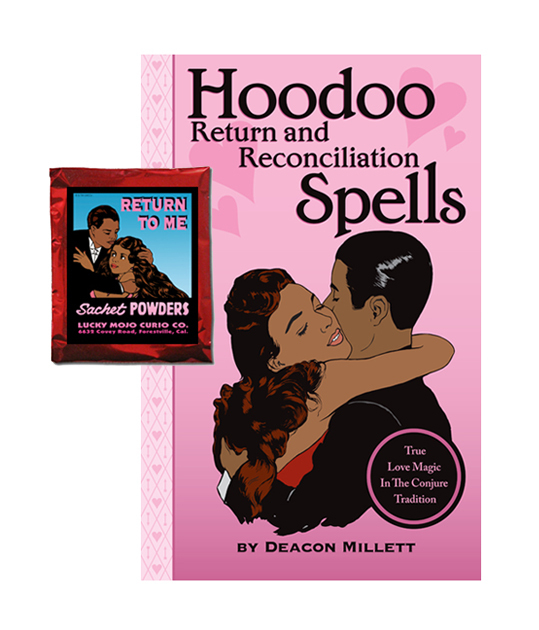 This week each lucky winner will receive a copy of Deacon Millett's book "Hoodoo Return And Reconciliation Spells: True Love Magic in the Conjure Tradition," along with a packet of hand-made Lucky Mojo brand Return To Me Sachet Powders for dusting onto candles and love-letters. First thing tomorrow morning, we will select FOUR winners at random, announce their names here, and ask them to message this Facebook Page with their mailing addresses, so we can send them their FREE Return and Reconciliation products. Thank you, Ernie, for posting this here in the Forum. I sure hope all the folks who sees this here will click the link and be carried on over to Facebook, where they can enter their names in the giveaway. The more, the merrier! Good luck to all. We have a winner! In fact, we have 4 lucky winners! Our Facebook Fridays! winners for November 9, 2018 are: Kristopher Hokanson, Cecilia Fagan, Tamara Angelique Thomasson, and Amanda Aparicio Le Gaux.